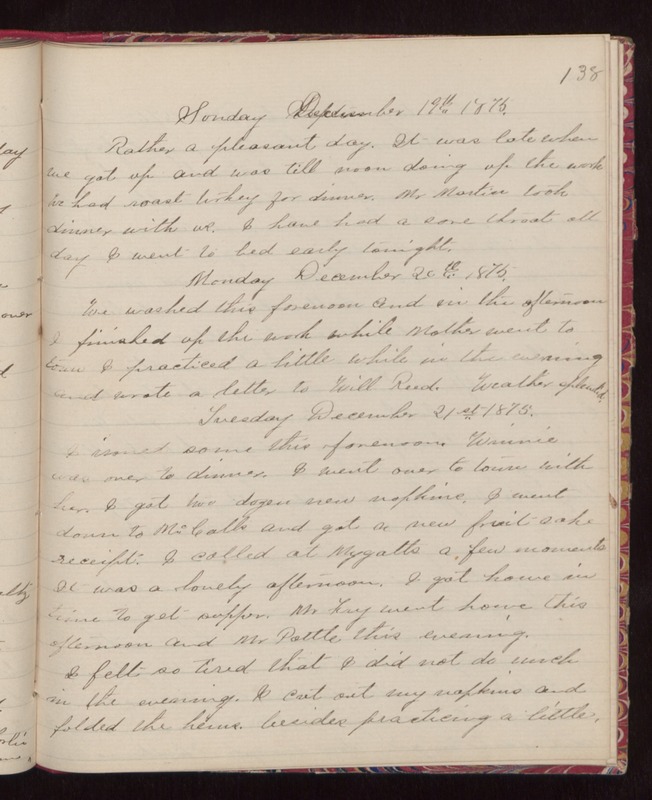 138 Sunday December 19th 1875. Rather a pleasant day. It was late when we got up and was till noon doing up the work We had roast turkey for dinner. Mr Martin took dinner with us. I have had a sore throat all day I went to bed early tonight. Monday December 20th 1875. We washed this forenoon and in the afternoon I finished up the work while Mother went to town I practiced a little while in the evening and wrote a letter to Will Reed. Weather splendid. Tuesday December 21st 1875. I ironed some this forenoon. Winnie was over to dinner. I went over to town with her. I got two dozen new napkins. I went down to McCalls and got a new fruit-cake receipt. I called at Mygatts a few moments It was a lovely afternoon. I got home in time to get supper. Mr Fry went home this afternoon and Mr Pottle this evening. I felt so tired that I did not do much in the evening. I cut out my napkins and folded the hems. besides practicing a little.